I normally drive with my lights on all the time. Unfortunately I have a G35 coupe that is unequipped with daytime running lights. One of the ONLY things I didn’t like about this car, UNTIL NOW. 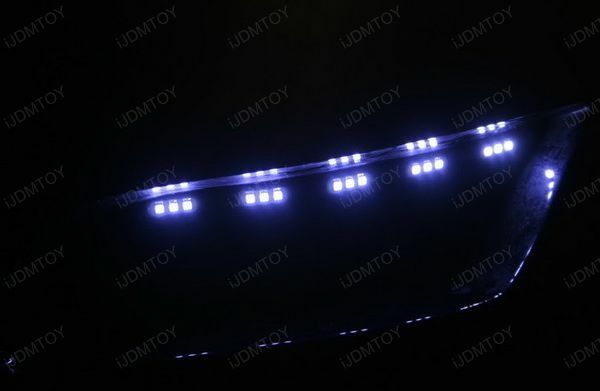 I found on iJDMtoy.com the Audi-Style LED Daytime Running LED light strips. I figured this is something that I’ve never done before, so there has to be others that have never installed these either. Maybe this DIY could help others in the future. I have never done any lighting modifications or automotive electrical work on my own before, so experience is not in my favor. 1. Gather materials – You will need either wire cutters, or a paring knife to retract the wire covering. I felt more in control with a paring knife. I also used a flash light, and straightened a wire hanger for this project. Electrical tape is also used. 2. Remove the side marker light from the front bumper and detach the bulb housing from the plastic light fixture. This will provide you the opening necessary to feed your LED wire through to be close to your side marker light bulb. Let the bulb hang in place while you are working. 3. 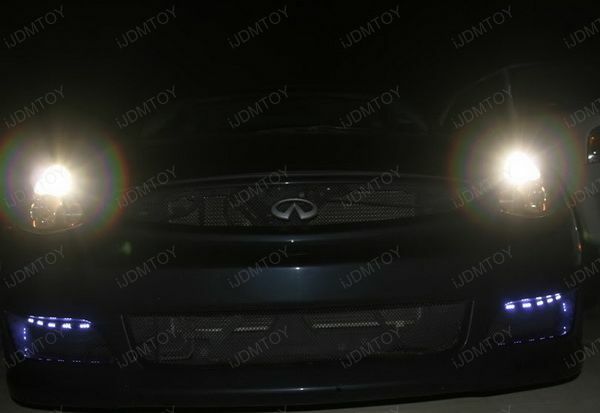 Determine where you want to place your LED strips in the lower vents of your front bumper. Make sure you have enough room to place the LEDs flat against the surface you plan to adhere them to. The LEDs are able to be cut, but I didn’t cut mine I used all 15 LEDs on the strip. 4. Feed the wire through the lower bumper up to the main side marker hole ( in the center, where the light bulb rests). Make sure you’re not feeding the wire through the smaller clip holes on the sides of the larger light bulb opening. I used the straightened wire hanger and created a loop at the end. I fed the hanger through the center hole of where the side marker fits into my front bumper all the way down to my lower bumper. I slid the LED wire into the loop of the hanger, and then pulled the hanger back out of the center hole slowly, thus feeding the wire to me. Let the LED wire hang through that hole. 5. Using the paring knife, strip approximately .5"(in) of wire covering from the red and black wires that connect the side marker light bulb. Go all the way around, exposing the copper wire below. BE CAREFUL, if you cut through this copper wire, your side markers will not work. 6. Using the wire cutters, expose the silver and copper wires of the clear LED cables by stripping approximately 1" of wire from the ends of both wires. You will notice one of the wires is silver, and one is copper even before stripping the wires. 7. Turn on your car lights (not your car). Test that your LEDs work by touching the SILVER wire of the LEDs to the RED wire of the light bulb, and the COPPER wire of the LEDs to the BLACK wire of the light bulb. The LEDS should turn on instantly, and all 3 lights should be on (headlights, side marker bulb and LEDs). If this is the case, proceed. If your lights don’t turn on, you could possibly have not stripped enough plastic covering off of the light bulb wires. Ensure that you are touching the wire and not the plastic covering. If you still have problems, you could have a defective strip of LEDs. Use the other strip of LEDs to test. 8. Once you have determined your LEDs work, TURN THE LIGHTS OFF. Then wrap the exposed wire of the LEDs around the corresponding (refer to step 7) color of the light bulb wires. Make sure you wrap as much of the exposed LED wire all the way around the bulb wire. When you are complete the LED plastic coating should be close to the exposed bulb wire. 9. Test your lights again to ensure your lights still turn on. Headlights, side marker bulb, and LEDs should all be on at this point. 10. If your lights still turn on, CONGRATS!!! Now TURN THEM OFF!!! You are ready to tape the LED wire to the light bulb wire. Using small strips of black electrical tape, (I cut about 2" of tape from the roll, and then using the paring knife, split that in half) wrap the half strip around each paired LED wire and bulb wire adhering them together. Once this is done, the electrical work is complete. 11. Gently replace the light bulb fixture back into the side marker housing and attach the housing back to the front bumper, taking care to feed the light bulb housing and new LED wires into the main light bulb hole. You should press until you hear both sides click into place. 12. Now you are ready to remove the adhesive from the rear of the LED strip, and place your LEDs on the pre-determined flat surface of your lower bumper. I adhered mine to the lower mesh of my K2 bumper. Now simply repeat for the other side. (starting at step 2) I was very pleased by the simplicity of this install having never done electrical before. As I said before, hopefully reading this will give others the confidence to try this install and bond with their car. I definitely got a sense of satisfaction once I saw the finished product. This was also the first install my 5 year old son got to help me with.. He held the flashlight for me the whole time and was my "light tester". He was amazed at the finished product as well and now thinks I’m a master mechanic. Let me know by commenting if this was a helpful DIY, if you have questions, please comment and I’ll respond as promptly as possible. Here are some finished images snapped right after install.